Whenever I meditate deeply on Baba, I invariably find myself uplifted into infinitely expansive blissful Love; and daily, in His presence, there is a palpable deepening into the awesome silence of the Self. Even on rough days - when I've cut my neck shaving and I've got diarrhea again and I've splattered mud on my new white pants and the rickshaw driver's hit the speed bump at 30 kilometres-per-hour making my head bang on the rickshaw roof and I've cursed loudly just before arriving at the ashram - even then, there's always a dose of bliss and peace from my Baba's darshan. I never cease to be amazed - what a Master He is! Those of us who have experienced Baba’s Love and omniscient guidance, and seen the profound transformations brought about in our lives by His grace, can only bow in gratitude, and do our best to love Him and serve Him and worship Him within all. 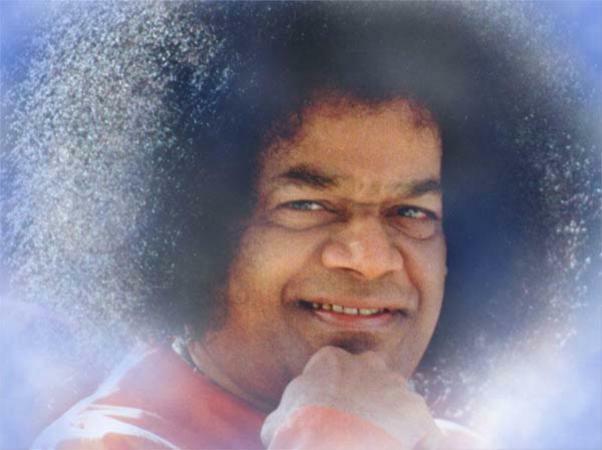 For Sai Baba is not a man; for me, He fully embodies the all-pervading God of Love (with a great sense of humor) who awakened me many years ago. I believe it can even be misleading to call Him "an incarnation of God" - for He is not that afro-crowned body in the orange robe giving darshan, the Guru who took birth in Puttaparthy. No. 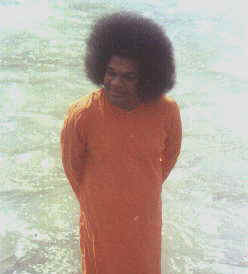 He is the all-pervading Ocean of Consciousness, the Substratum and Creator of all universes! That ochre-clad body we see before us is but a wave on the shoreless, all-encompassing Sea of Satchidananda, who Sai Baba is. “I am neither Guru nor God. I am You; You are I; that is the truth. The appearance of differences is the delusion. You are waves; I am the ocean. His true form (and ours) is indeed all-embracing, and yet transcends all manifestation. As a full embodiment of that limitless Paramatma, Sai Baba is Holiness itself, and His every word and action are nothing less than Divine Love in motion, healing Grace flowing effortlessly into our parched and thirsty world. To that supreme Being, I bow. Who is Sai Baba? In His own words, “Sai Baba is Love, Love, Love!” He is the Creator of all universes, the Author, Producer and Director of the universal play... and He is the supreme Reality beyond even the word ‘God’, beyond any duality - prior to any creation, prior to time. He is the changeless eternal peace of Brahman. And He is you. He’s reading these words through your eyes right now. And when you look at His photo, He’s looking right back at you, seeing your entire heart, mind and soul, loving You with all the Love of God, and sending a ray of Divine Light to help you on your journey to Self-Realization. May His grace descend upon you now, like a million goose-down feathers in the snow.